Despite extensive efforts to replicate a firmament in which the angels would be comfortable engaging in coitus, the divine beings largely remain far apart on clouds at opposite ends of their enclosure. VATICAN CITY—After months of failed attempts to coax their sole mating pair into conceiving, officials from the Vatican City Zoo admitted Wednesday that they were unsure whether the facility would ever successfully breed an angel in captivity. The current effort is reportedly part of an ongoing campaign by the zoo, home to Christendom’s most diverse collection of holy fauna, to increase the world’s angelic population, which has dwindled to fewer than 400 heavenly creatures in the wild. “Nevertheless, we still hope that one day we will welcome a new baby angel into our zoo’s Heavenly Messenger Pavilion,” he added. 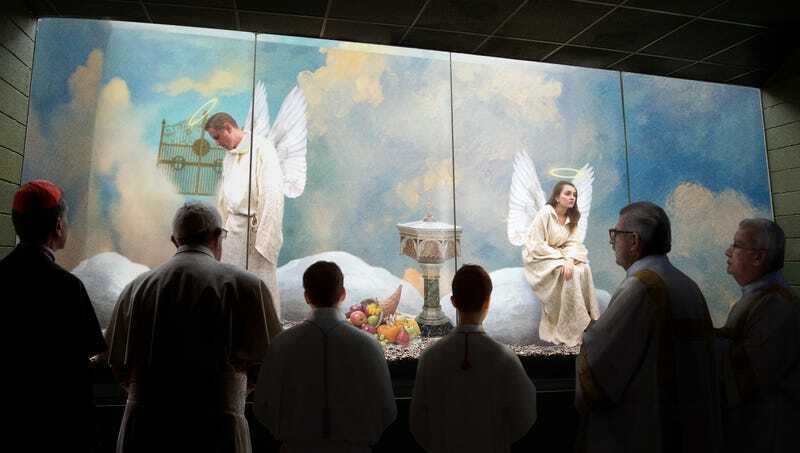 According to sources within the Holy See, zoo staff built an approximation of the angels’ natural habitat to facilitate breeding, installing sidewalks paved with gold throughout their concrete enclosure and a $300,000 motion-activated mist system to simulate clouds. Reports also confirmed that a special, secluded cage has been set up as far away as possible from the exhibit’s main viewing platform, which is often crowded with photo-snapping bishops and loud Sunday school children known to discourage angelic coition. However, despite the zoo’s best efforts, Menichelli said the male and female angels seldom show interest in each other, and on the rare occasions they do, the pair often becomes spooked prior to the act of copulation by sounds coming from the Leviathan and Behemoth cages in the nearby Hall of Beasts. The cardinal added that the problem is compounded by the fact that female angels are only in heat once every jubilee year. Records indicate the zoo’s latest angelic breeding project follows a series of botched efforts dating back to the early 1970s. In a widely publicized 1984 incident, an attempt to mate two seraphim on loan from the Lourdes Zoo and Aquarium failed when the much larger and more aggressive male shouted, “Holy, holy, holy is the Lord of Hosts; the whole Earth is full of His glory!” and proceeded to tear the wings off the female, setting the program back by more than a decade. Menichelli confirmed the zoo would try artificial insemination next, just as soon as it received the Church’s permission to collect a sample.